Factory orders shrank by 3.5% in November, which was actually the best monthly rate for 2015. 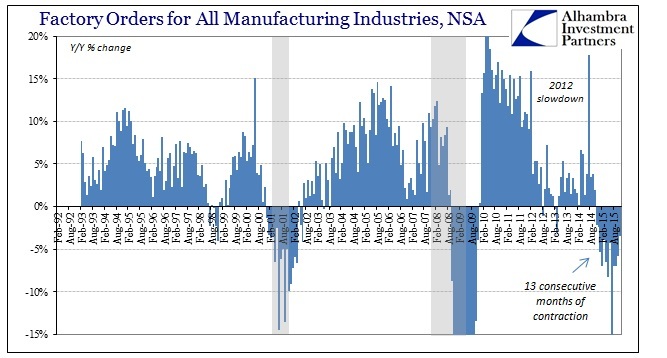 Unfortunately, that continues a streak of 13 consecutive monthly declines as the manufacturing recession continues to persist. The more important 6-month average is still worse than -7%, which remains not far off the worst part of the dot-com recession by comparison. Seasonally-adjusted, factory orders were down again in November and continue to stall at levels last seen in 2012. That remains the relevant interpretation, as the longer factor production remains significantly underneath the relevant growth trajectory (which was itself short of full recovery) the greater the chances that factories in bulk decide to scale back rather than adjust. Since the series here is factory orders, we can reasonably assume that an actual production turnaround is still well into the future. Perhaps by itself, factory orders do not demand full recession recognition but there is no denying the depth of the contraction so far in how it compares only with prior recession circumstances. The cumulative eleven months of 2015 are a shocking 6.8% below the levels of 2014 (through November 2014). That is exactly the same contraction for the same eleven-month period in 2001 which contained the whole of the dot-com recession. 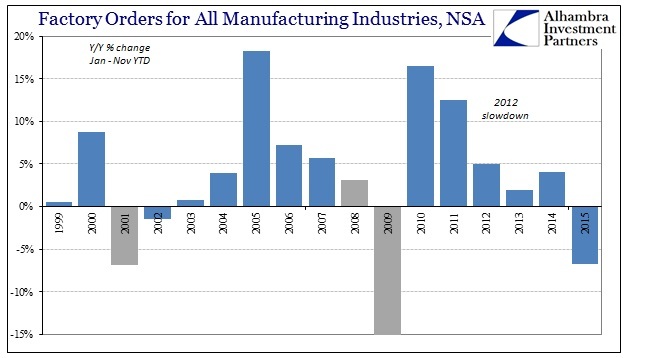 Again, the point of comparison with regard to recession and factory activity is rather obvious (below). In dollar terms, -6.8% doesn’t immediately suggest the scale of the deficiency. 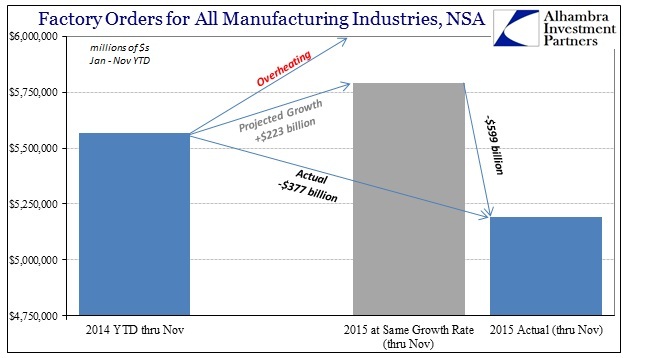 For the eleven months through November 2014, factory orders totaled $5.57 trillion – again, belying the idea that manufacturing is limited to 12% of the economy. The cumulative total through November 2015 is just $5.19 trillion, suggesting straight away a $376 billion hole. 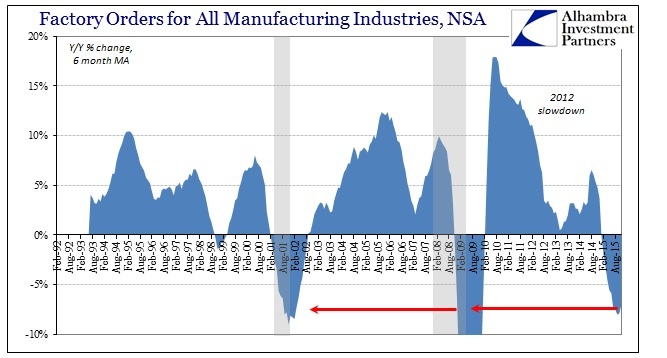 While that would be enormous, in fact we have to assume, reasonably, that manufacturing was not expecting a repeat of 2014 levels of orders especially when every economist and media outlet was reporting incessantly the “inarguable” arrival of the long-sought full growth. In that respect, the baseline assumption for 2015 was at minimum the same level of growth as 2014. Some manufacturers were undoubtedly thinking even better than that, as mainstream economic interpretations were awash with ideas of “overheating” in “demand.” Therefore we can assume that factory orders matching 2014’s growth rate would have been somewhat disappointing, meaning a cumulative total of at least $5.79 trillion. That estimates the grand production hole for 2015 as not $376 billion but rather a few million shy of $600 billion; at minimum. There is a world of difference in $600 billion, a gap the size of most second-tier economies. I have little doubt that manufacturers (and the rest of the supply chain) have made adjustments along the way throughout this year, but there is no way that gap can be maintained forever by relatively minor adjustments; businesses can only wait on Janet Yellen for so long. And as much as economists really want this to be isolated into nothing but “overseas” turmoil, the size of it completely removes that possibility; there can be no doubt that US “demand” is sufficiently underperforming as well. This was partially the point I was trying to make yesterday in criticizing the “services economy” as an answer to the production gap. Even if services are growing robustly, it doesn’t follow that that would be enough given that most of what counts as services in GDP is fake imputations. What is real are things that act almost like a tax upon consumers; health care, utility bills, financial services fees, etc. Further, inside GDP accounting, the “goods economy” is itself diminished by the “value added” theory which drives the basis for GDP accounting. Actual productive businesses, however, aren’t so concerned with that tabulation scheme as they are staring directly at the $600 billion hole that gets larger by the month whether or not GDP and trend-cycle remain a positive number. 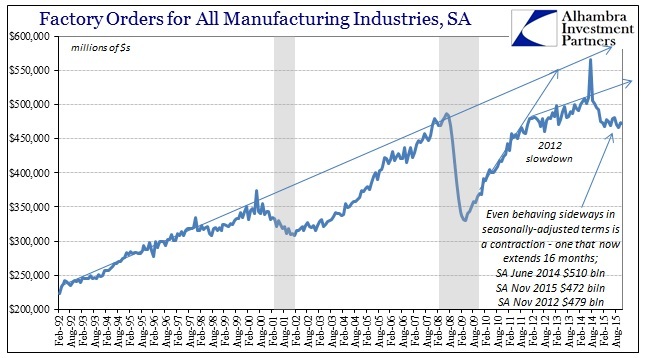 In that respect, the manufacturing recession such that it already is may be a recession in fact awaiting only a recession in statistics (i.e., revisions). That might seem backwards, but that is economics. Where else might you find a “discipline” that totally ignores forward-looking markets (real discounting, not stocks), makes absurd excuses for coincident levels of actual economic outcomes predicted by those markets, all in favor of really blind guesses for tomorrow from regressions and equations that haven’t yet delivered what should have been already. Then, after all that, once forward-looking markets are further proven correct and coincident economic activity sinks still more, the regressions will be rerun to declare to the world what it long ago already knew. Until that time, we can marvel at how -$600 billion is supposed to be the very edge of overheating.